Note: The following article was published in The Golden Legacy column of the Brunei Times on 30th June 2007. When His Majesty Sultan Haji Hassanal Bolkiah Mu’izzaddin Waddaulah, the Sultan and Yang Di-Pertuan of Brunei Darussalam exchanged the new Brunei’s and Singapore’s $20 currency notes with His Excellency Mr. Lee Hsien Loong, Prime Minister of the Republic of Singapore on 27th June 2007 to celebrate the 40th Anniversary of the Currency Interchangeability Agreement between the two countries’ currencies, that day marked the first time that the Brunei currency shared a similar currency note design with another country in more than 40 years. On that day, Brunei and the Singapore issued new $20 notes which shared the same reverse (back) design even though the obverse (front) of the two notes are different. The last time the currencies even shared the same design was prior to the 1967 issuance of Brunei’s very own currency notes. As one of the ancient kingdoms of the Malay archipelago, Brunei's historical legacy is long and can be comparable or if not exceeding that of other better known empires in the region. Among others, its strategic geographical location and well sheltered harbour has made it a safe place for ships that ply their trade in the Southeast Asian region from as early as the 6th Century. Brunei had been known by many names in the past. In the Chinese historic annals, Brunei had been written about as far back as 1,500 years ago in the Liang Dynasty (502 to 566 AD). Then the Brunei predecessor state of Poli sent tributes to the Chinese bearing the produce of the country. Subsequent visits by other Chinese tavellers to Brunei included that during the Sui Dynasty (581 - 618 AD), in the Tang Dynasty (618 - 906 AD) and Sung Dynasty (960 - 1279 AD). Brunei surprisingly, was the last among the Borneo states to have its own postage stamps. The Dutch East Indies (now Indonesia) which included Kalimantan first issued theirs in 1864, Sarawak in 1869, the British Colony of Labuan, despite not being a state, in 1879 and North Borneo (now Sabah) in 1883. We, in Brunei, only issued our first postage stamps in 1895 and even those were considered by the early stamp enthusiasts as unofficial. 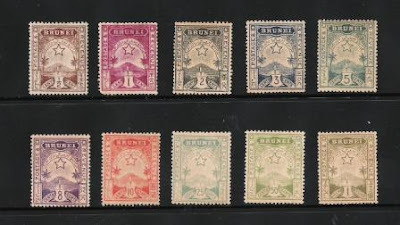 Prior to that 1895 issue, the first postage stamps used in Brunei were the Sarawak stamps which were used in Muara, then known as Brooketon, as Rajah Brooke ran the coal mining operations there and used those stamps for the postal service in the community from 1893 to 1907. 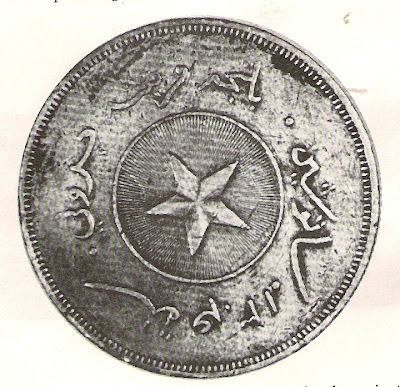 The first Brunei stamps in 1895 were considered as controversial and known in the stamp world as the 'Brunei Locals'.